Third in the parcel of ebooks sent me by Angry Robot, a publisher whose works I often find intriguing. Just not this one. Go to Japan in my place. Find the Gate. Your camera will show you the way. There are many torii gates in Japan. Finding the specific one Keiko’s father meant seems an impossible quest. Unfortunately for Keiko, her search proves all too possible. Keiko’s father has drafted his ignorant daughter into a war spanning universes and ages. It is not until she finds the mysterious gate that she begins to suspect what is happening … and it is only thanks to tourist guide Yui Akiko that she survives the discovery. Yui is not just a guide: she is one of this world’s kami, elemental spirits. She is a warrior as well, in a war ancient beyond telling. Aeons ago, ambitious kami essayed a daring magical experiment. It did not go entirely well; Vissyus, the greatest of them all, went mad and turned on the world. The cost of containing the mad kami was vast devastation and the lives of many kami; even then, Vissyus was only contained, not destroyed. And the walls of his prison are weakening. If the world is to survive, Keiko will have to join Yui and the other kami, and help defend the world against an ancient evil. I will say this for the kami: they do at least use their secret control of Japan to ensure that most of the population is evacuated out of the Big Fight Zone before buildings start being leveled. Points to the residents for dutifully leaving. All those earthquake and tsunami drills paid off. Pity about the tourists, but they were warned. I wanted to like this novel, but it just wasn’t my thing. I kept wondering why Keiko’s dad thought sending Keiko unforewarned into an apocalypse was a good idea. I can see why it made sense to the author, because it gave him a viewpoint character who required infodumps. The novel’s multiple viewpoints were confusing; the book was unfocused. There were a lot of epic fight scenes. Again, not my thing but I know that others may differ. Looking at the author’s note, I see he cites as influences authors like Jordan, Sanderson, and Tolkien1, authors for whom I do not particularly care. If he’s drawing on material I do not like, it is no surprise that I am not engaged by the result. I do think there is one difference between the author and his idols, though, and it leads me to make a suggestion I normally would not make: Maybe Yatsuhashi should embrace the epic model wholeheartedly. Rather than a single, self contained novel, perhaps what his story needed was something more Wagnerian in scale…. 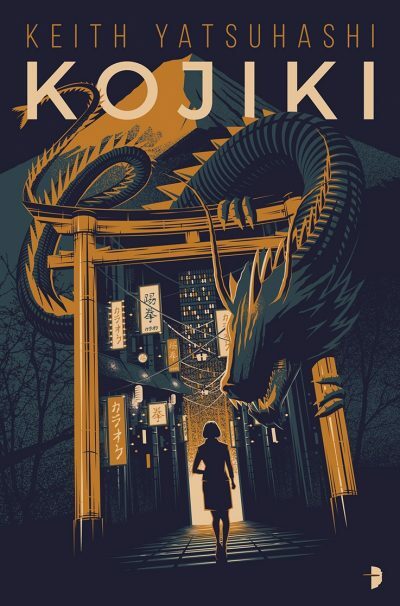 Kojiki is available for pre-order here.